According to AwardsDaily.com, The Lost Weekend is ranked as the number one Best Picture winner that would never have won today. The films dark subject matter that, today, would certainly earn an R rating, meant that filmmakers had to work hard to even get the movie made, let alone released. But in the end, The Lost Weekend surprised everyone as it was adored by critics and won Oscars for screenplay, actor, director, and picture. And it certainly surprised me, too. 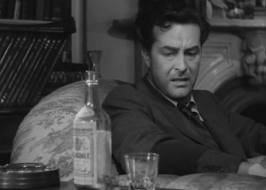 Don Birman (Ray Milland) is seriously addicted to alcohol, to the point where he hides them in unusual places and even stiffs the maid in order to get some gin. Don always wanted to be a writer, and even planned at one point to write a novel based on his experiences of alcohol. But throughout the story, he finds himself fighting for his inner humanity and soon finds himself a threat to himself and others. This movie is held together by three strong anchors. The first is Milland, who delivers a tragic performance as Don. Even when he’s doing the most despicable things, we still identify with him because we know about the good man inside. Yeah, to me, this is what Great Ziegfeld should have been. The second thing is the direction. William Wylers direction is simply phenomenal. I love how he sets up the shots and centers the movie around this character. I think the writing is pretty good too, even though I don’t have any experience with alcohol and I don’t know how much of this is accurate. And third, the ending. Without spoiling anything, I will say that it made the movie for me. Now, it seems almost pointless to discuss the production quality, seeing as how it naturally keeps improving with every new movie. But I will say that I loved the cinematography, and the sound design was well-put together. This is a must-see. And by the way, I realize that this is my fourth five star Best Picture in a row. What can I say? The academy loves these movies. I realize I’m sounding like a broken record, but let me tell you, the next one better be stupid.